charmcityartsmaven: FULLY UNSCRIPTED PLAY RETURNS TO SINGLE CARROT STAGE FOR 10 DAYS! DON’T MISS IT! FULLY UNSCRIPTED PLAY RETURNS TO SINGLE CARROT STAGE FOR 10 DAYS! DON’T MISS IT! 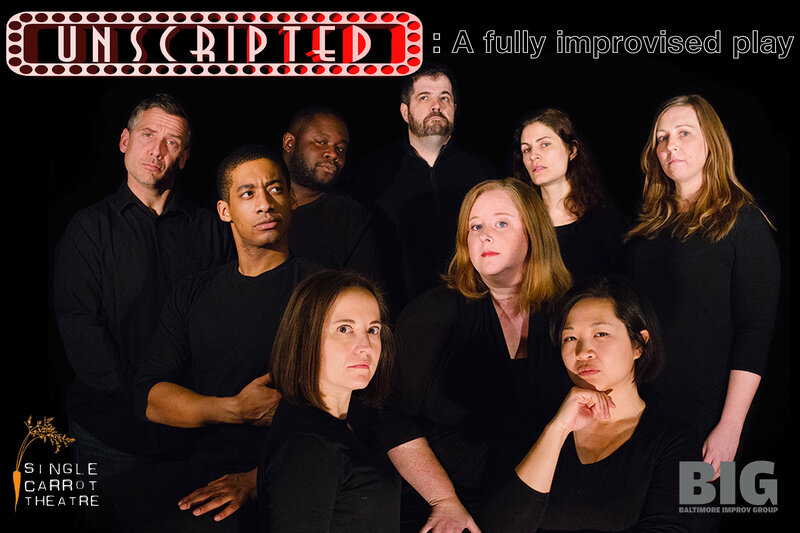 Baltimore Improv Group’s Unscripted returns to the stage for its 10th year. You bring the props and the suggestions. They’ll create a different play, every night, for ten nights. Discounts are available for current BIG University students—contact your instructor for more info. Also coming up this month, BIG in the Community! Join us for a night of laughs art Har Sinai Congregation's BIG Benefit! Spend an evening with friends for food, drinks, a silent auction, and a performance by the Baltimore Improv Group! Proceeds benefit HSC Youth Groups and educational programming! Join us for Nosh, Nibbles and Giggles at our B.I.G. Benefit! WHEN: Saturday, April 29 7:00p.m. - 11:00p.m. Spend an evening laughing with friends as the Baltimore Improv Group (BIG) performs at Har Sinai Congregation. Your ticket includes: 2 drink tickets, buffet dinner with choice of Prime Rib, Salmon, and a vegetarian option & silent auction. Catering provided by Martin's Caterers. Cash bar available for those who wish to purchase additional drinks. All proceeds support HSC youth groups and educational programming. Har Sinai Congregation is the oldest continuously Reform Jewish Congregation in the United States. Educational programs span all ages, encouraging Congregants to never stop learning. HSC continues to believe that the children of today are the leaders of tomorrow. Please visit www.harsinai-md.org if you wish to learn more about Har Sinai Congregation.